my ramblings | expressions: Coolpis: Who wouldn't want to drink something with a name like Coolpis? Coolpis: Who wouldn't want to drink something with a name like Coolpis? Ahh, refreshing Coolpis... THE soft drink to offer guests - before removing their blindfolds. 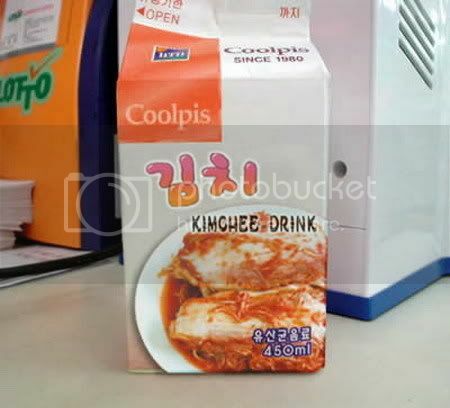 Actually a Korean copy of the disturbingly named Calpis, Coolpis comes in Peach flavor and (stop reading now, if you can...) Kimchee flavor (??!!). Kimchee, for those unacquainted, is a traditional Korean dish made from fermented cabbage and LOTS of red pepper. Makes Peach flavored Coolpis almost appealing, doesn't it?